As its subtitle suggests, One Night on TV is Worth Weeks at the Paramount explores the integration of popular music into early television. Much of Murray Forman’s recent published work focuses on contemporary hip hop studies, but this volume is the result of extensive archival research: Forman analyses internal memoranda from the music and television industries, trade journals, press releases, mainstream press articles and reviews, and industry analyses, as well as the television programmes themselves. Emphasis is on the post-war period, from the late 1940s through to 1955: Forman notes the paucity of research into television music pre-Elvis, and posits that histories of television do not attend to the important role music played in this formative period. The six chapters trace the development of music on television, starting with TV’s experimental phase in the late 1930s. Forman begins with a detailed account of music’s role in television’s earliest years. Musical performances were often used in experimental broadcasts, and by the mid-1940s, Forman argues, executives were sure that popular music would be essential to the new medium (although there were protracted conflicts with the musician’s union, American Federation for Musicians (AFM) about pay parity with radio performances and fair residual payments for using previously recorded performances). Conflicting discourses about television’s potential emerged, however: some musicians were keen to adopt the opportunities for promotion offered by the new medium, while others were concerned that TV appearances would cause reduced revenues at live performance venues. By 1955, though, TV had established its vital role in the entertainment sector and people were no longer so anxious: “With the confidence that accompanies stability and familiarity, they went to work, making music in a world with television” (114). Television practices and aesthetics eventually solidified. Forman uses the “ersatz nightclub” genre and the DJ/teen music genre to illustrate how production formulae were standardised, and he describes the two main sets of values underpinning early performances on television, “televising” and “musicking”, which were sometimes in conflict. For example, “funny hats” routines maintained the visual interest desired by network executives, but some musicians did not want to sacrifice their artistic (musical) integrity in order to be humorous. The commercial imperative of U.S television (gaining audiences; retaining programme sponsors) was already strong at this stage: for example, known musical performers were often hired for television because they conveyed known values that would not provide an off-putting or negative image. Forman notes that by the mid-1950s, stable broadcasting conventions had evolved as more tightly defined technical and performance practices took hold. Finally, Forman discusses representations of African Americans and Latin Americans. There were many more African and Latin American musical performers on television than actors in drama or sitcom programming. Forman notes that the radio conventions of representing African Americans carried over to television, and that the networks encountered issues trying to retain appeal with southern audiences, where segregationist policies were still followed. “Black musicians and the black press were, each in their own way, highly engaged in liberating the airwaves and challenging the attitudes and practices of this nascent sector of the entertainment and culture industries” (272). During this same period, Latin American music was increasingly popular in post-war TV programmes (and thus ripe for commercial promotion), and representations of it were discursively related to the U.S.’s ‘neighbourly’ foreign policy, even though Latin Americans themselves were often portrayed as foreigners. Latin identities could be seen on TV, then, but were also “isolated, contained, or safely bracketed from the moral and aesthetic values of the dominant social mainstream” (296). …early television is fraught with clumsy, fumbling performances and with the unassailable brilliance of countless musicians. With all their failings and all of their achievements on full display, television’s pioneers learned how to produce and present “television music” (Coates, 2007), in the process inflecting art, culture, and life in post-war United States with new meanings (339). One Night on TV would have benefited from additional contextualisation: more information about what else was screening on TV during the 1948-1955 period would provide a better sense of the significance of music programming, and how it compared in quality to other broadcast material. Moreover, although the focus on U.S. television makes the study manageable, some acknowledgement of television’s development globally would provide useful points of comparison: many statements about the “development of TV” are presented as universal, when they are specific to the U.S. industry (there is no entry in the index for the BBC, for example, even though the Corporation was experimenting with television broadcasting during the same period that Forman covers). Despite these limitations, One Night on Television is Worth Weeks at the Paramount is a rich resource. 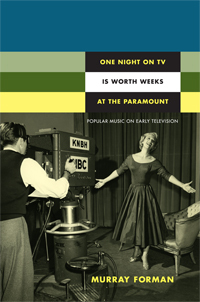 The detailed descriptions of television musical performances and the analysis of such a wide range of archival sources provides a comprehensive account of the emerging practices and processes of television music in the U.S.A: this is valuable to any scholar interested in the history of television, popular music, and music on screen.